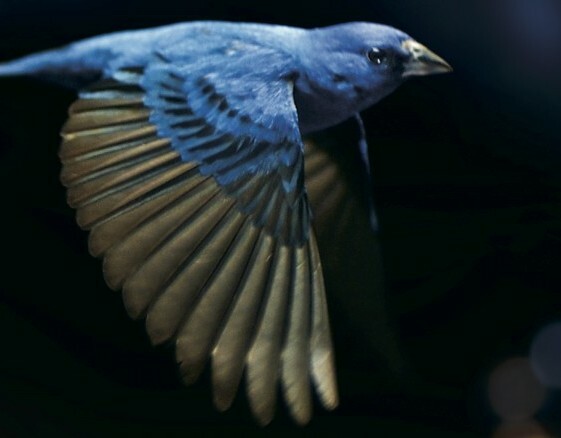 Posted on December 16, 2015 by Joan W.
Mass Audubon recently hosted a screening of the film The Messenger, a new documentary describing the challenges faced by migratory songbirds. The film is sweeping in scope, beautifully filmed, and touches themes resonant to all who love nature. The film paints a vivid portrait of the struggles birds face every day while they are simply trying to stay alive and reproduce in today’s rapidly changing world. Bird populations are declining due to multiple threats (habitat loss, cat predation, collisions with buildings, hunting, and pesticides) and the film is informative in its exploration of the leading causes of bird mortality. With all of these threats, viewers may be left wondering, how can we help? Here are recommendations, some big, some small, but all designed to help save and protect the nature of Massachusetts. Go Outside and Play! Take the time to go outside every day, even for just a few minutes. Listen for birds, identify their calls, make notes, watch a bird feeding, flying, building a nest, take your children or grandchildren on a nature walk and make a bird list. Visit the open space in your town, in your neighborhood, or by your office, and share your love of birds. Take a birding program at a Mass Audubon Nature Center – we’d love to have you. The closer your daily connection is to nature, the happier you will be and the stronger advocate you will become for protecting open space right here in Massachusetts. Buy Bird-Friendly Coffee and Paper. Shade-grown and reserve-grown coffee each have real benefits for resident tropical birds as well as “our” North American species that winter in the tropics. Two great options are Birds and Beans and Café Solar. Smithsonian also certifies bird-friendly coffee, and a list of their vendors can make ordering easy. Look for paper certified by the Forest Stewardship Council (FSC), for your home and office. This is from well-managed forests, and your purchase can help to drive better forest management as demand for FSC certified products increases. Keep Your Cat Indoors. We love our pets, and we love your pets too. Indoor cats live longer and healthier lives. Cat predation in the US and Canada alone annually causes the death of at least 2 billion wild birds – adults and nestlings. Cats are not native to North America, and our wild birds did not evolve with them as predators. If your current cat is an outdoor cat, shift them to an indoor life style, or at least take the pledge for your next pet to be indoors-only. We recognize that this concept may take years to catch on, but please do your part by keeping your cat indoors. Green Your Electricity. Range changes due to climate change could imperil nearly half of U.S. birds within this century. Switching to green energy is one of the most effective ways to reduce your impact on the environment. Mass Audubon’s Make the Switch campaign can help you take meaningful action against climate change. Share this with your neighbors and friends. Investing in green power will pay dividends to the next generation, think of it as your gift to them. Reduce Your Consumption of Meat. Meat, particularly red meat, is one of the most energy intensive, and land consuming foods we buy – about 270 pounds per person, per year. Production of meat is fuel-intensive, water intensive, and can cause long-term damage to the landscape. Much of this “hoof print” occurs as hay and corn are grown and harvested to feed or “finish” cattle. It takes about 6.7 pounds of grain or forage to make ¼ pound of beef. You can reduce your carbon, water, and land-use footprint today by choosing a meat-free meal a few times a week – boost the value of this by buying vegetables locally. No, your doctor did not tell us to include this, but we think he or she will approve. Reduce Bird Window Collisions. Over 600 million birds are estimated to be killed by window strikes each year. The majority of these become fatally disoriented by artificial light from skyscrapers during migration. Mass Audubon works with The City of Boston to run Lights Out Boston which reduces energy and helps save migratory birds. Learn more and sign up. You can also help at home by installing decals or other treatments to ensure your windows do not reflect foliage or sky. Support Bird Conservation Programs. Supporting local conservation, through local land trusts, will help to keep your great outdoors an open playground for the animals that thrive there, and give you and your family and friends a place to recharge and build memories. On a larger scale, projects like Boreal Birds Need Half are leading the way in conserving the “lungs of the planet”. Help them save the boreal bird nursery, and the important CO2 sink that has the added benefit of fueling our songbird migrations. Mass Audubon is here to help protect the birds of Massachusetts, forever. Since 1896 we have worked to identify and measure challenges to birds, and to build innovative solutions while we educate the next generation of conservation leaders. With your support, we will continue to address the challenges to birds and to all of the Nature of Massachusetts. Please Donate to Bird Conservation! This entry was posted in Events, Resources on December 16, 2015 by Joan W..